I dearly love antique postcards! Such a snapshot of another age! And the Christmas ones are so charming! 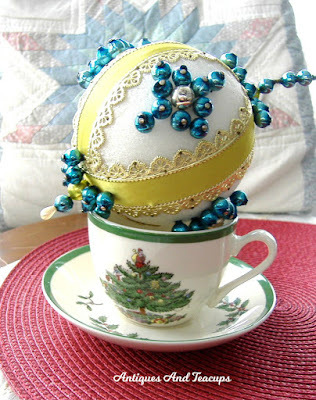 Handmade ornaments and teacups...what's not to love? Have a lovely day, and a cup of a holiday tea! Tuesday Cuppa Tea post for Dec. 3rd is HERE or click on the logo and come visit! Lovely treasures!Have a blessed day too!Maristella. I love the Spode Christmas tree pattern. I have the teapot and mug and would love to add the teacup, like yours, to my collection. It's That time of Year Again ... Lambing Time ! December 25th Wishing you a Merry Christmas! December 24th Antique Postcard, Mince Pies! 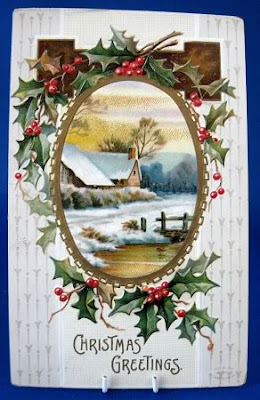 December 14th Christmas Postcard, Newest Tea... ?